I love today’s card :). Ace’s speak of change and new cycles of destiny – like the seasons these “phases” all sort of blend into one another and an Ace means the start of a new season. This particular Ace – the Ace of Cups features all manners of abundance and blessings. It is filled with opportunity and reminds us of the importance of seeking inner peace during times of transition. 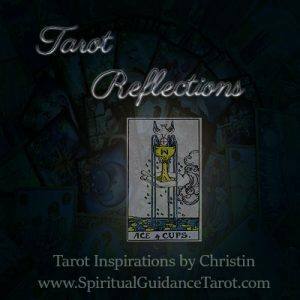 The Ace of Cups is a symbol of great joy and abundant creative energy. In this card we see the flow of water from heaven into the cup as it spills over. The message is one of Divine inspiration, spiritual fortitude, creative energy all flowing in abundance into your life should you choose to look for them. This card reminds you that it is always a good day to say “thank you” for all the blessings you have received, thereby opening the door for more to flow in. Get inspired today! Be creative in all your ventures, and be willing to try something new. When this card shows up for spiritual guidance it suggests a period of happy surprises and discovery as things will flow well. This card is also a reminder that it is better to not struggle with “what should I do?” and rather just go with the flow and allow Spirit to guide your actions in times of doubt or confusion. When you still the mind; creative new solutions have room to appear and inspire you.